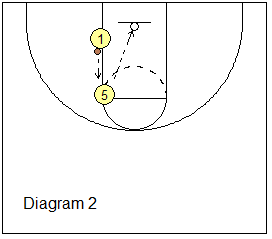 This offensive drill (with video from Ganon Baker) teaches how post players should rotate, move and space when a guard dribble-penetrates. There are three post rotation movements for both a baseline dribble-drive and a dribble-drive to the middle-elbow. When running the drill, have a line of post players under the basket, and a line of guards on the wing. Diagram 1 shows a baseline drive and here the post player lifts up to the elbow area for a pass from O1 and the shot (diagram 2). When running the drill, the coach will also pass a second ball to the passer so that both get a shot. Diagram 3 shows the baseline dribble-drive and the post player lifting to the middle or opposite side for either a bounce pass, or a lob ("alley-oop") and dunk. 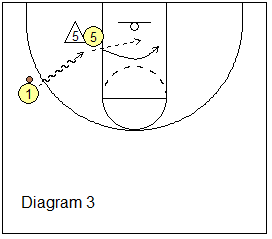 Diagram 4 shows the baseline dribble-drive and the post player O5 sprinting out to the arc and replacing the guard. 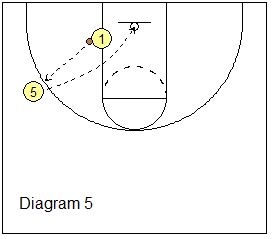 O1 jump stops, pivots and passes back out to O5 for the shot (diagram 5). Coach Baker says that the penetrating guard has four possible passing options... a forward or a reverse pivot and pass outside, a behind the back bounce-pass out, and a hook pass (over the shoulder pass). Diagram 6 shows the dribble-drive to the middle, and the post player slides out to the short corner for the pass and short jump-shot. 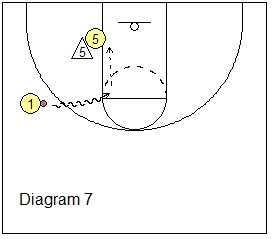 Diagram 7 shows the dribble-drive to the middle and a post seal. 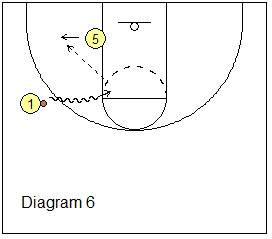 Recognizing that the post defender X5 is fronting, O5 simply seals X5 and get the pass from O1 for the lay-up. 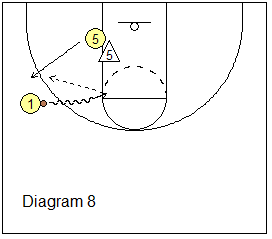 Diagram 8 shows the dribble-drive to the middle and the post player replacing. O5 sprints out to the arc and replaces O1. 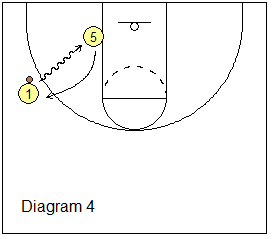 O1 jump stops and passes back out to O5 for the shot. 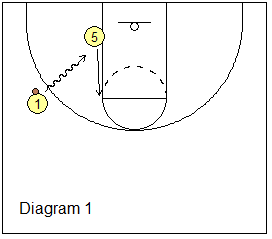 When running this drill, at first drill each individual post slide for several repetitions. Then finally allow the post player to mix it up so that O1 has to learn how to recognize the post's rotation and find him/her. with Ganon Baker, Founder of Elev8 Sports Institute, Owner of Ganon Baker Basketball, WNBA/NBA Nike Basketball Training Specialist, Ambidextrous Shooting Coach, World Renowned Instructor and Clinician. He has worked with LeBron James, Kyrie Irving, Anthony Davis, Amar'e Stoudemire, Kevin Durant, Grant Hill, Brittney Griner, Skylar Diggins, and Maya Moore.